I was very impressed with how quick my item was delivered. I am very happy with my product and the price. I will be doing more business with you in the near future. A TOSLINK cable with all the bells and whistles. Complement your home theatre with a rugged, high-performance TOSLINK cable. Avencore Platinum Series TOSLINK cables deliver high quality digital audio over an optical link, free from external sources of EMI/RFI and ground-loop interference. Great for home theatre and gaming applications using an optical SPDIF link! 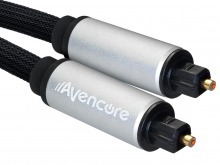 Using low-attenduation, single-strand synthetic cores and stylish finishing touches, Avencore Platinum Series TOSLINK cables are a fusion of form and function, perfect for all your SPDIF optical needs. With them, you can enjoy up to 192kHz and 24bit audio - delivered cleanly between compatible hardware. The robust synthetic core offers high durability and minimal resistance, allowing for lengths up to 15 metres to operate without any drop in bandwidth, while hard-wearing nylon braiding, PVC jacket and aluminium plug barrels ensure the cable will last the test of time. Useful in any home theatre or home office setting as well as light commercial and retail installations, the Avencore Platinum Series TOSLINK range pairs perfectly with the Avencore Platinum Series HDMI 4K cables and Avencore Spectre Series Digital Audio Converters (sold separately). Use them with your PC, Laptop, Amplifier, TV, Speaker System or any other SPDIF Optical device! I ordered a Pro series 3 metre Toslink Cable for my Apple TV. I went for the slightly more expensive Pro series as I was a bit nervous about the quality I might get but I need not have worried. I was quite frankly amazed at the quality of this cable for the price. (or twice the price for that matter). I've always been a bit wary of ordering online unless it's for a product I know and from a supplier I trust. I was doing neither in this case but the order arrived super fast and I couldn't be happier with the product. Two dollar shipping is fantastic as well. From now on, if Cable Chick stocks what I need, I'll be buying it from them. I am a newbie to AV and Cable Chick provided me with compelling information on upgrading my older 5.1 surround sound cables to Fiber Optic. After receiving the cable and realising you plug it in by removing the white bubble end cap, my system lit up in wonderfully clear surround sound. More importantly, the cable was a one-in-a-million faulty product (the gold sleeve would not stay in position hence the cable fell out of the amp.) Upon a brief email to Cable Chick, my problem was solved with a no-fuss replacement. I knew the cable was otherwise of high quality and knew the replacement would still be excellent product for an OEM price. The Pro Series TOSLINK to TOSLINK lead was of solid construction with a thick cable in length. Just before Christmas I purchased a Panasonic 50 inch plasma TV together with a blue ray sound system. I was pleased with the performance which was easily as good as my previous system. However on reading the manual I found that Panasonic recommended an upgrade using an HDMI cable and a TOSLINK fibre optic cable. Of course they were not supplied with the system and had to be bought as an optional extra. At this stage I started to investigate the cost of these cables on the internet. To my disappointment I found them to be quite expensive, even more so if purchased at a retail outlet. That is until I found Cable Chick. Would you believe, less than half price and that included postage. I was not quite sure what would be best for my system so I phoned Cable Chick and was given good advice. I then decided to place an order. I was concerned that I had never used my credit card online so I again phoned in and nothing was too much trouble. My order was taken and payment made over the phone. This was at about 3.45pm. Could you believe it my cables arrived in my PO Box the very next morning (and I live in the country well away from the major cities). Excellent service. Thank you! As to the performance of my new system- The sound while originally good, with the new cables is now BRILLIANT. After the experience of my dealings with your staff I would be happy to recommend Cable Chick not only for the courteous and friendly service and the speed of order processing but most of all for the quality and price of the products. A TOSLINK Cable for all occasions. 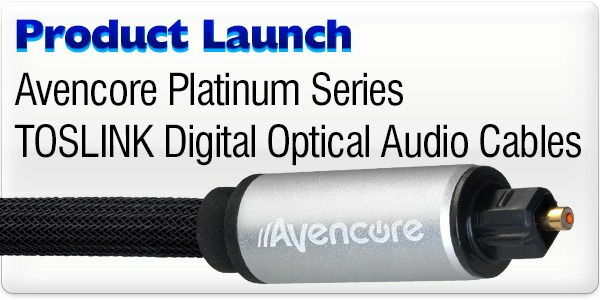 The Avencore Platinum Series TOSLINK lead is a robust and capable solution for all your SPDIF optical audio needs, capable of the highest bit-rates and sample frequencies between compatible equipment. Eliminates the risk of interference, regardless of length. Does what it says. Perfect balance between performance and price. The end connectors really snap into the socket well and arent loose like some other cheaper Toslink cables.